HHS Secretary Tom Price will testify Wednesday to the priorities and initiatives of federal health agencies as hearings for President Donald Trump's first proposed budget begin. Health programs took a huge financial hit under the proposal. HHS' budget, which is the largest of any federal agency, is cut by 16%, making it poised to lose $12.6 billion if the budget were enacted as written. Price has praised the budget despite the losses. 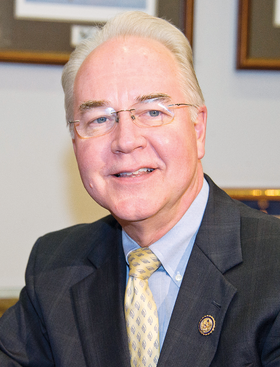 “This budget supports that mission and will help ensure we are delivering critical services to our fellow citizens in the most efficient and effective manner possible,” Price said in a statement. He added the budget will spur HHS to work more efficiently. Overall, Price appears to be handling the loss of HHS funding rather well. At a town hall this month, Price said measures in the GOP's Obamacare replacement bill that overhaul Medicaid and strip it of hundreds of billions of dollars over a decade would not result in lost access to care. He said the program should be measured by how it works, not its budget. In the GOP bill's latest incarnation, $839 billion would be cut from Medicaid. Provider groups have slammed the budget proposal, titled America First: A Budget Blueprint to Make America Great Again. The budget pulls $5.8 billion from the National Institutes of Health's nearly $32 billion budget. It's not clear what research on diseases or disorders would lose the most money, although the budget plan specifically calls for eliminating a division that focuses on global health. HHS spending on opioid-addiction prevention and treatment efforts would rise by $500 million. The U.S. Justice Department would also receive funds to combat the epidemic.